Romanian Journal of Biology - Plant Biology, abbreviated as ROM. J. BIOL. - PLANT BIOL., publishes original papers from the following fields of plant biology: molecular biology, biochemistry, genetics, cytology, morphology, physiology, microbiology, systematics, chorology, geo-botanics, ecology, phyto-pathology. Review papers on current topics in Plant Biology are also included. The contents is completed by additional chapters: I. The Scientific Life presents scientific events in Plant Biology (symposia, conferences, etc. ); 2. New books. 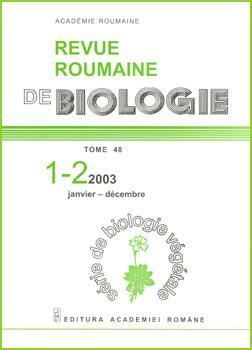 Starting with the volumes 49-50, Revue Roumaine de Biologie, Série de Biologie Végétale has changed its name into Romanian Journal of Biology - Plant Biology (ISSN: 1843-3782).